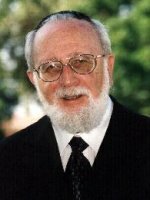 Birkat Avraham is a Charitable Fund that has been established in Memory of Rabbi Halbfinger. Rabbi Abraham I. Halbfinger’s congregation describes him as having been a “visionary, spiritual leader, teacher and role model.” For 40 years he shared these capacities with the Jewish Community. After his ordination by Rabbi Isaac Elchanan Theological Seminary of Yeshiva University, Rabbi Halbfinger served congregations in North Adams and Lawrence, Massachusetts. In August 1966, Rabbi Halbfinger became spiritual leader of Congregation Kadimah-Toras Moshe in Brighton, at that time a community of mostly elderly first-generation Americans. The Rabbi revitalized the congregation, not only attracting young families through his personal magnetism and compassion, but also working for the construction and renovation of housing for the elderly. Rabbi Halbfinger’s service to the greater Jewish Community has been wide-ranging and significant. His impact has been daily as rabbinic administrator of the Rabbinical Court of Massachusetts, Va’ad Harabonim and Kashruth Commision since 1974, and his expertise on kashrut is a resource for both vendors and consumers. Globally, the Rabbi worked for the liberation of Soviet Jews from the beginning of that movement, and he has been a strong supporter of the State of Israel. Locally, he cared for the elderly and the needy through constant efforts toward affordable housing. He also served as chaplain at Massachusetts General Hospital and as a trustee of Combined Jewish Philanthropies. “He is a very unusual community leader who, with great sensitivity, is able to build bridges across agency, synagogue and denominational lines, ” said one prominent agency director. Rabbi Halbfinger was a member of the Rabbinical Council of America, and a member and former President of the Vaad Harabonim of Massachusetts. He was on the board of the Jewish Community Relations Council as well as the board of directors of the Combined Jewish Philanthropies. He was also a member of the State of Massachusetts Governor’s Council on Chaplaincy. Rabbi Halbfinger was a strong advocate of affordable housing in the community. He was a charter board member of the Bnai Brith Housing development. He participated in the formation of the Charlesview Housing Corporation, a housing development that is partially owned by the Congregation and which had Rabbi Halbfinger as a former President.